What at first looked like the flip-flop of the century was soon revealed as a sophisticated ruse by a coalition of African, North American, and European activists including the Yes Men. The purpose: to highlight the most powerful nations' obstruction of meaningful progress at the UN Climate meetings in Copenhagen, to push for just climate debt reparations, and to call out Canada in particular for its terrible climate policy. Canada's breakneck rush to exploit the massive Alberta tar sands, one of the most energy intensive and carbon spewing projects on the planet, is the primary cause of Canada's outsize carbon footprint. 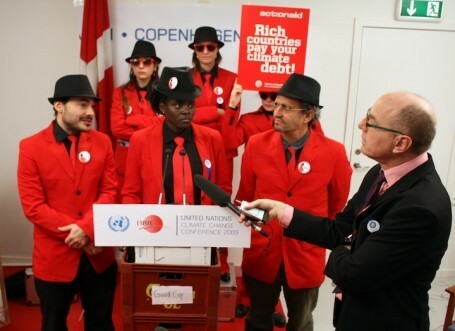 The elaborate operation to call out Canada's obstructionist ways was spearheaded by a group of concerned Canadian citizens, the "Climate Debt Agents" from ActionAid, art students from Denmark, and The Yes Men. From deep inside an underground bunker in a secret location in Copenhagen, in a faux auditorium fashioned with cardboard boxes and pipe cleaners made to look like the UN climate conference center (Good COP 15), "Canadian government representatives" announced a bold new initiative to curb emissions and spearhead a "Climate Debt Mechanism" for the developing world. The ruse involved a flurry of press releases, announcements, retractions, and video footage of Canadian and African climate negotiators sparring over a number of contentious issues. In the first release from "Environment Canada", Canada's Environment Minister, Jim Prentice, waxed lyrical. "Canada is taking the long view on the world economy," said Prentice. "Nobody benefits from a world in peril. Contributing to the development of other nations and taking full responsibilities for our emissions is simple Canadian good sense." This was followed by a press release of the Ugandan delegation's supposed reaction, including a dramatic video, and a fake Wall Street Journal article about the whole thing. These releases were then followed by a supposed retraction. Out there in the real world, Dmitri Soudas, the Prime Minister's spokesman, went mental and was filmed screaming at a hapless Canadian ecologist, accusing him of having organized the whole thing. (Dmitri was sent home the next day). 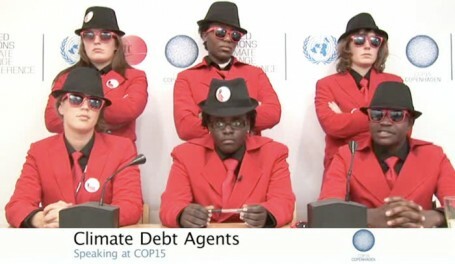 Besides leaving Canada with egg on its face for its terrible climate policy, the point of this multi-media operation was also to highlight the concept of Climate Debt. While 75% of the historical emissions that created the climate crisis come from 20% of the world's population in developed countries (according to the UN), up to 80% of the impacts of the climate crisis are and will be experienced in the developing world, according to the World Bank. The developed countries got rich by endangering the developing ones—don't they owe them something? The government of Canada has used strong-arm tactics to shut down two parody websites criticizing Canada's poor environmental policy, taking down 4500 other websites in the process. The two websites, "enviro-canada.ca" and "ec-gc.ca", are "directly connected to a hoax which misleads people into believing that the Government of Canada will take certain actions in relation to environmental matters," wrote Mike Landreville from Environment Canada in an email to the German Internet Service Provider (ISP) Serverloft. "We trust you appreciate the importance of avoiding confusion among the public concerning Canadian governmental affairs and that you will assist us in preventing this hoax from spreading further." In a remarkable overstepping of bounds, Landreville also asked the ISP to "make every effort to prevent any further attempts concerning other environment-related domains (enviro, ec-gc, etc.) originating from your servers." In response to Environment Canada's request, Serverloft immediately turned off a whole block of IP addresses, knocking out more than 4500 websites that had nothing to do with the parody sites or the activists who created them. Serverloft was shown no warrant, and never called the web hosting company about the shutdown. "We are sorry to see that the Canadian government will not 'take certain actions' that could help stave off catastrophic climate change," said Mike Bonanno of The Yes Men, one of the groups that performed the "sophisticated hoax" two weeks ago that involved the fake sites. "And we are also sorry to see that they don't care so much for free speech." "Surely the Canadian government has better things to do than shut down thousands of websites, beg the US for photo opps, and berate NGOs for things they haven't done," said Andy Bichlbaum of The Yes Men. "They could instead figure out reasonable ways of responding to their growing legion of critics." The websites that Canada shut down were part of an elaborate "identity correction" carried out by anonymous Canadian activists, the Climate Debt Agents of Action Aid, and The Yes Men. They used press releases and fake websites to announce that Canada would adopt science-based emission targets - reducing emissions by 40% over 1990 levels by 2020 and 80% by 2050 - and would pay the countries most impacted by climate change a proportional amount of the $600 billion total recommended by the United Nations to mitigate and adapt to climate change. They even used a replica of the UN conference center podium to show "Uganda" reacting with glee to the plan, before seeing their "tragic hopes" dashed. Canada had prepared for just such an eventuality by creating a so-called "Climate Change War Room," a special office tasked with delivering rapid-response messaging to any negative media coverage around Canada's role at the Copenhagen climate change negotiations. Despite these efforts, last week's flurry of parody announcements, which the prime minister's office called a "childish prank," received enormous media attention across Canada and caused at least two embarrassing media moments for Canadian high officials. Canada has been heavily criticized for its increasingly deplorable climate policy, and this year in Copenhagen was awarded the "Colossal Fossil" prize for worst behavior in the COP-15 negotiations. The group giving the award, the Climate Action Network, is a global coalition of more than 500 organizations working on climate change.